Kenny Wells, the son of a very successful businessman in the mineral industry (gold specifically) who just can’t seem to catch fire like his father did, and instead continues to tumble down the rabbit hole of business failure after business failure. He has reached rock bottom early in the film as a functioning alcoholic running his company out of a smoked filled bar with no prospects in sight. Nothing is going right for Kenny except he has a woman who loves him, warts and all, named Kay (Bryce Dallas Howard). She sees Kenny’s potential but isn’t consumed by it. Kay really is the moral center that a film about gold mining, shady Wall Streeters, 1980s level excess living absolutely requires. If nothing else, Wells owes the little bit of sanity that he has left to Kay and Kay alone. One night, Kenny has an alcohol inspired a vivid dream, you get a sense that this isn’t particularly uncommon for this walking “what not to do in life” character. He dreams of finding an untouched spot deep in the jungle that he will build a gold mine and finally have his reverse of fortune. Simultaneously, he remembers meeting a man named Mike Acosta in Indonesia who was a brilliant geologist who impressed him with a theory of finding extremely valuable minerals that no one else agrees with at the time. Using his last bit of money, he books a flight and sets up a meeting with Acosta in Indonesia. There could not be a larger dichotomy between Wells and Acosta. The film does a great job in establishing the physical manifestation of the lives these two men lead. Where Wells is out of shape, wild-eyed, balding, and stricken with bad teeth we have Acosta, the good looking South American, chiseled features, smoothly dressed who could walk right onto the cover of one of those ridiculous romance novels. Their personalities also followed these lines. Wells is loud, boorish, pig-headed where Acosta is always cool, calm, and open to reason and dialogue. The two men eventually team up and find their untouched space in the jungle and eventually hit gold. The film really isn’t much about the gold, but rather what happens to those who find it and those who find themselves caught near the vortex of this success. Relationships are changed forever, trust is challenged, and nothing is ever as clear cut as you might have thought. Bring in elements of the aforementioned excess lifestyle of the 1980s juxtaposed with the very real jungle aspect in Indonesia made for the enjoyable transition. The chemistry between Bryce Dallas Howard’s Kay and McConaughey’s Kenny Wells was truly a bright spot in this somewhat morally-lite film. Howard’s performance was subtle when it was demanded, but she was able to call up some pivotal angst in the face of her new found situation. Edgar Ramirez was doing nothing that he hasn’t done before. He’s an actor that I have enjoyed in most things, but I am beginning to see the word “typecast” stamped across his forehead with each role. 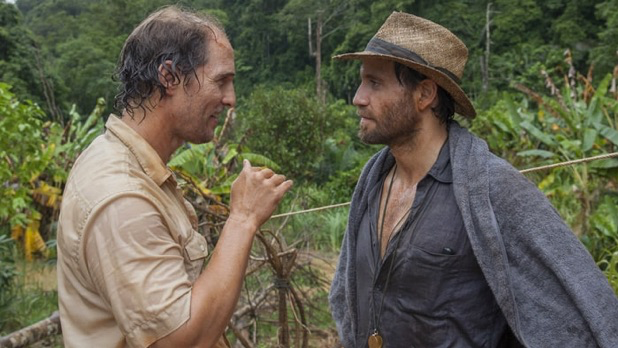 I think that McConaughey would actually be a great tutor for Ramirez, as he had to break out of the “good looking pretty boy” roles before he was taken seriously in Hollywood. Ramirez has the potential but he needs to be given the opportunity, unfortunately, Gold didn’t do that. Lastly, Matthew McConaughey delivers a solid performance that won’t win him any Oscar nominations but will stand as yet another example that the actor has every right to be considered a serious actor. Again, for a man who was seen largely as an empty headed pretty boy, he is able to show the life of Kenny Wells in all its grit, grime, and lovable ways without much difficulty. Gold is a fun watch with interesting and intriguing characters, but by no means will it be a breakout in the minds of critics or audiences this year.